Upon arrival, you are picked up at airport and escorted to the hotel for check-in. Appreciate the distinctive architecture in Wat Si Saket, built in the Siamese style of Buddhist architecture, with a surrounding terrace and an ornate five-tiered roof. Pha That Luang is a gold-covered large Buddhist stupa, generally regarded as the most important national monument in Laos and a national symbol. Patuxai, resembling the Arc de Triomphe in Paris, is also on your visit-list. It is typically Laotian in design, decorated with mythological creatures such as the kinnari. 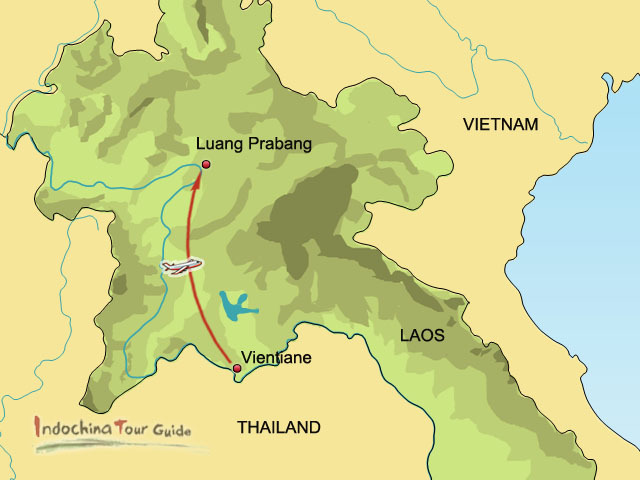 Take the morning flight to Luang Prabang from Vientiane about 40 minutes. 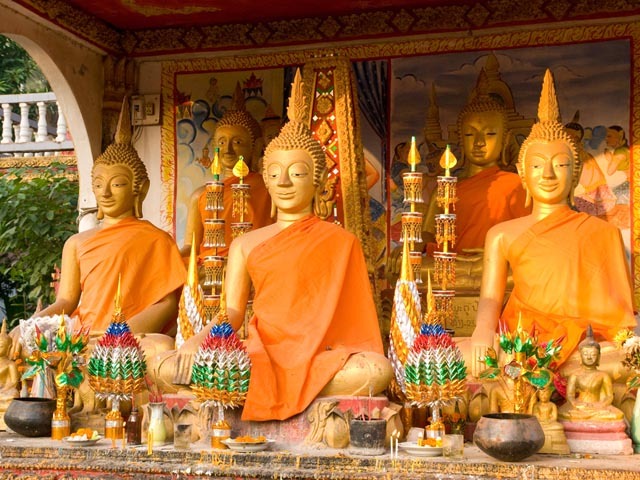 Visit Wat Xieng Thong (Golden City Temple), remaining a significant monument to the spirit of religion, royalty and traditional art. 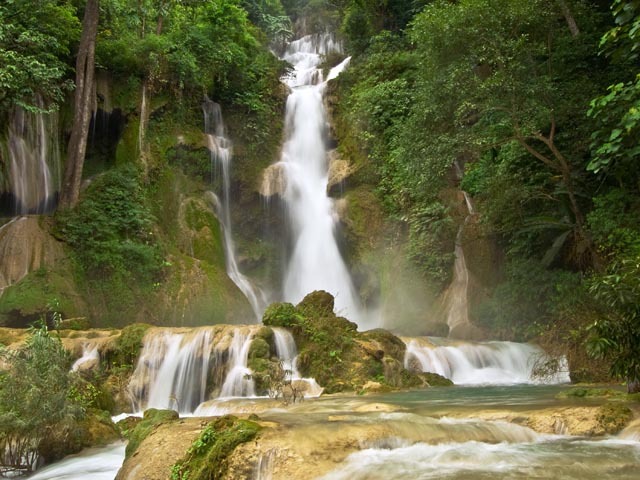 Appreciate the stunning Kuang Si Waterfalls, which cascade down a multilevel limestone formation creating a series of turquoise blue pools perfect for swimming in on a hot day. (Note: when bathing, please wear a sarong, no bare bodies). En route, stop at a small village inhabited by one of the country's numerous ethnic minorities. You can learn more about their traditional way of life and unique customs. Climb up 350 steps to the top of the Phou Sii Hill to visit Wat Phu Sii and enjoy the spectacular views in each direction. An optional early start gives you the fantastic opportunity to participate in the daily morning rituals of saffron-clad monks collecting offerings of Alms (often in the form of sticky rice) from the faithful residents. This tradition is very unique in Laos. Visit Royal Palace Museum (Haw Kham), which was built in 1904 during the French colonial era for King Sisavang Vong and his family. Boat on Mekong River to visit the famous and sacred Pak Ou Caves, noted for hundreds of miniature Buddha sculptures in different positions. 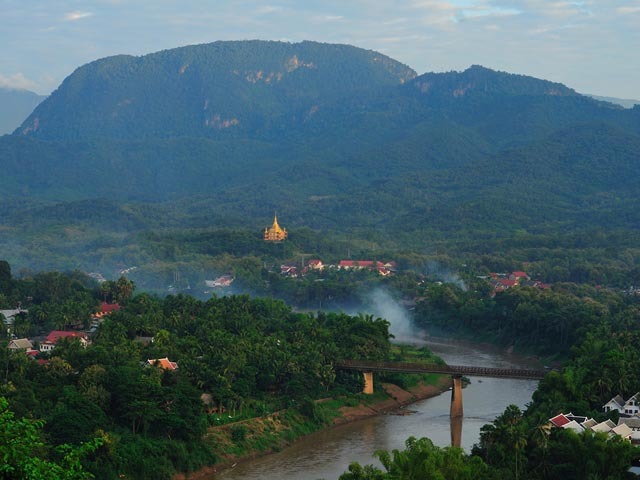 Enjoy your free your time in Luang Prabang until departure.